More than $2 Million for the Crohn's and Colitis Foundation of Canada! This past Saturday, May 10th, franchisees, staff and thousands of volunteers at the more than 465 M&M Meat Shops locations across Canada joined together to raise $2,050,000 for the Crohn's and Colitis Foundation of Canada (CCFC). It is a new record for the M&M Meat Shops Charity BBQ Day, which fundraises to support vital research to find a cure for Crohn's disease and ulcerative colitis, also known as inflammatory bowel disease (IBD). To date M&M Meat Shops' franchisees, customers and volunteers have raised more than $16 million for this vital cause! Saturday marked the 20th Annual M&M Meat Shops Charity BBQ Day, and Canadians from coast-to-coast were out enjoying thousands of hamburgers and hot dogs in support of the CCFC. Every cent raised will go directly to the CCFC to help find a cure for IBD, a disease that affects more than 200,000 Canadian men, women and children. "Once again, Canadians demonstrated incredible support for Charity BBQ Day, raising more than $2 million for CCFC," says Mac Voisin, Founder and Chairman of M&M Meat Shops. "Our sincere thank you to everyone who helped make the 20th Annual Charity BBQ Day the most successful yet. We could never have accomplished this amazing feat without the help of thousands of volunteers and our dedicated M&M Meat Shops franchisees, who tirelessly facilitated BBQs and promoted the event in their local communities across the country. We also want to sincerely thank our generous suppliers, including Maple Leaf Foods, Frito Lay Canada, Old Dutch and Associated Brands, who continue to support us and donate their products for this event." "On behalf of the CCFC and the thousands of IBD sufferers across Canada, we are grateful to M&M Meat Shops for their continued support and commitment to our search for a cure," says CCFC National Volunteer President Victoria Prince. "Contributions from the M&M Meat Shops Charity BBQ Day have funded some important developments in Canadian research, including: establishing the CCFC IBD Research Institute; launching the landmark GEM project looking at the Genetic, Environmental and Microbial factors contributing to the onset of Crohn's disease; and helping our Canadian researchers to become world-recognized leaders in the search for the cure." 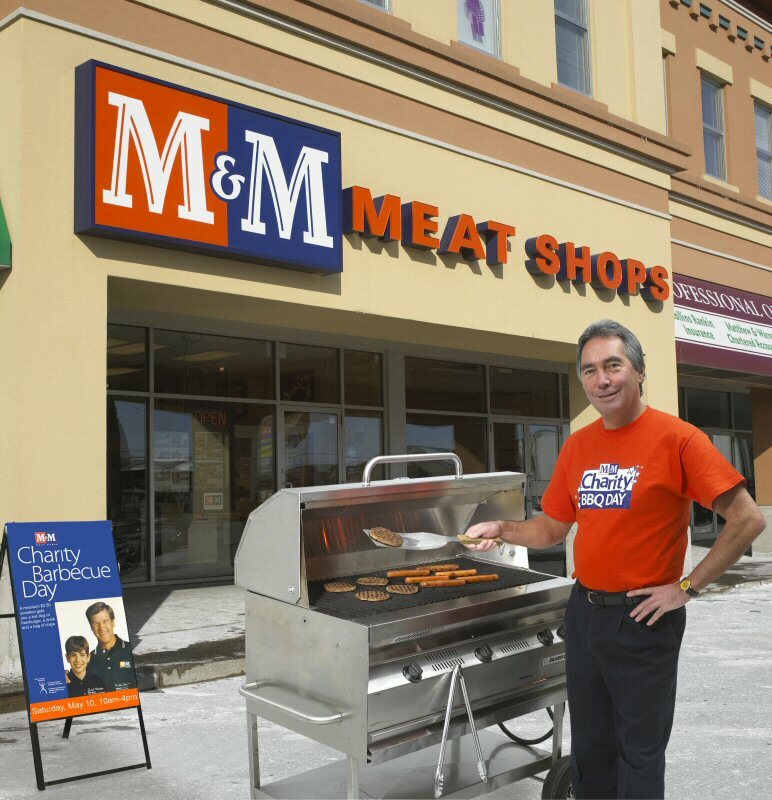 A Kitchener-based business, M&M Meat Shops opened its first store in 1980. The chain now has more than 465 locations across Canada. M&M Meat Shops offers hundreds of meal ideas for today's busy families in just one aisle, with products ranging from succulent steaks to delicious desserts and convenient meal ideas. For more information on M&M Meat Shops or for tips on hundreds of meal ideas visit www.mmmeatshops.com. The Crohn's and Colitis Foundation of Canada (CCFC) is a voluntary, not-for-profit, medical research foundation dedicated to finding the cure for Crohn's disease and ulcerative colitis. The Foundation is also committed to educating IBD patients, their families, health professionals and the general public about the diseases.